If the world's most powerful computer can control even Superman ... no one on earth is safe. $13.352 million on -unknown- screens. Call it the “Third Film Curse”, but of the two major superhero movie franchises, their third entries have marked definite declines. Granted, some would argue this tendency in regard to the Batman series. Many folks loathe the second flick, 1992’s Batman Returns and think that 1989’s Batman is the best of the bunch. While I really like Batman, I feel that BR was the most consistent and compelling of the four. For me, it was the third picture that started the decline. For 1995’s Batman Forever, Tim Burton ceded the director’s chair to Joel Schumacher, and the films would never be the same. Frankly, Forever was a decent little movie, but it didn’t compare to the pleasures found in its predecessors. The only subject upon which most parties agree is that the fourth film - 1997’s Batman and Robin - was the worst of the bunch. I like the characters enough to make that flick watchable for me, but I have to agree that it’s mainly a dud. Within the first four Superman films, similar lines become drawn. 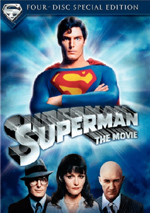 Most people prefer the first movie in the series, 1978’s Superman. 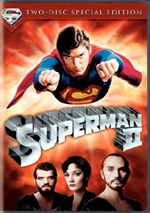 However, the first sequel, 1981’s Superman II maintains a substantial audience of partisans, and quite a few folks believe it’s the best of the bunch. 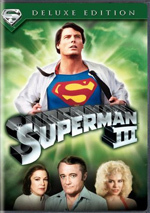 I’m sure someone feels that either 1983’s Superman III or 1987’s Superman IV is the most satisfying entries in the series, but you’ll be hard-pressed to find them. As for SIII, I didn’t think that the movie was a total disaster, but it seemed to be generally weak, especially when compared with the first two flicks. SIII introduces a fairly large roster of new characters; of the four films, it most substantially rewrites the cast slate. Old favorites like Lois Lane (Margot Kidder), Perry White (Jackie Cooper), and Jimmy Olsen (Marc McClure) make brief appearances, but they play only small roles in the story. We also find no trace of our Superman’s (Christopher Reeve) previously established archenemy Lex Luthor (portrayed by Gene Hackman in the first two flicks). Instead, SIII focuses on a totally new list of friends and villains. The plot splits along two lines. On one side, Clark Kent - Superman’s alter ego - wants to go to his high school reunion and write a feature article about it for “The Daily Planet”. Editor White agrees, and though Olsen initially accompanies him, a convenient accident gets him out of the way. Once he returns to Smallville, Clark encounters past acquaintances, the most significant of whom is Lana Lang (Annette O’Toole). Clark maintained a serious crush on her during high school, and it now looks like he might have the chance to get to know her better. One wonders why he apparently no longer cares about Lois, the established love interest for Superman from the first two films, but whatever the case, Clark and Lana start to develop a modestly romantic relationship. While this occurs, we follow a second plot in which we meet unemployed goofball Gus Gorman (Richard Pryor). After his benefits end, he goes to a computer trade school and there discovers a true talent for the machines. From there he gets a job with a huge corporation owned by vicious tycoon Ross Webster (Robert Vaughn). When Gus cleverly embezzles a modest amount of money, Ross declines to punish him as long as Gus will use his skills to help enhance Ross’ wealth. As such, Ross forces Gus to manipulate a weather satellite so that it’ll ruin the coffee crop in Colombia. Unfortunately for them, Superman steps in and prevents the damage. Thus foiled, Ross swears revenge on the Man of Steel, and he makes Gus create a synthetic form of Kryptonite to kill Supes. This doesn’t work as planned because a small portion of the analyzed sample was “unknown”. Gus substitutes tar instead and lets it do its job. The faux Kryptonite doesn’t kill Superman, but it does alter his personality. Suddenly Supes becomes a member of the “me first” club and he refuses all attempts to do good. Eventually he snaps out of this, of course, and he sets his sights on Ross and Gus. In the meantime, Gus has created a Ross-financed supercomputer that will attempt again to kill Superman. Got all that? Good - now throw it out the window. None of the story makes any difference whatsoever, as the entire film is nothing more than an excuse to stage some ineffective action sequences. Superman III ultimately felt like it was cobbled together out of a vague concept: Computer vs. Superman. The rest of the story was thrown against a wall and sorted out from there, but no one bothered to develop the characters or create anything of much interest. Actually, that’s not totally true, as SIII offers a few minor moments of fun. I must admit that the shots of Nasty Superman were a modest hoot. Reeve seemed to relish the opportunity to play the Boy Scout as a scumbag, and while Nasty Supes never became truly vicious, he still could be quite entertaining. Unfortunately, these scenes were almost negated by a truly ridiculous segment in which the two sides of Supes - during which Clark represented his good part - faced off against each other. “Man vs. Superman” was nothing more than a weak piece that seemed inane. Although the manner in which Lois was disposed of seemed to be illogical and callous - and apparently occurred due to a spiteful attitude the film’s producers held toward Kidder - I will acknowledge that the scenes with Lana were somewhat interesting. I liked this look at Clark’s past, and O’Toole maintained a simple, gentle charm that made her seem endearing. The manner in which the two plots coincide appeared silly, but during the film’s quieter moments, these sequences added emotion to the piece. Otherwise, SIII fell almost totally flat. Director Richard Lester tried far too hard to invest the film with comedic elements, and these resulted in goofy slapstick that was out of place in this sort of film. Really, the entire Gus side of the story was a waste. By this point in his career, Pryor was in his “please love me” mode that resulted in tripe like The Toy. He used to have a spark and an edge to his work, but by 1983, he presented all of the risk of a teddy bear as he chewed the scenery. The segments with Gus took up far too much of the film. At times movies that focus fairly heavily on villains can work. For example, the first two Batman flicks offered a lot of coverage of their baddies, and this didn’t harm the result. However, those pictures had a more competent director and they included better actors; Pryor was a fine comedian, but his acting - at least by 1983 - left a lot to be desired. Gus wasn’t even really a villain; he had to act bad to avoid troubles of his own. Clearly Gus received so much screen time because Pryor wouldn’t sign on to the film otherwise. Unfortunately, that meant we spent much of the movie with a character who was a dud. Ultimately, Superman III managed to avoid becoming unwatchable, but the overall package was quite weak. A few fun moments are negated by loads of silly antics and forced comedy. Though neither Superman nor Superman II were perfect films, they look like works of genius compared to this dud. 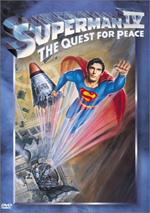 Superman III appears in an aspect ratio of approximately 2.35:1 on this single-sided, dual-layered DVD; the image has been enhanced for 16X9 televisions. This was a good little transfer. Sharpness usually appeared to be reasonably crisp and detailed. During some wide shots, I detected a modicum of softness. However, these instances weren’t too frequent. As a whole, the image looked well-defined and distinct. I saw no examples of jagged edges or moiré effects, and edge enhancement created no concerns. Print flaws were absent, as the movie seemed clean and fresh. Colors also looked pretty solid. Granted, the hues could appear slightly drab at times. For example, the scenes at the high school reunion presented flat tones. However, most of the movie seemed to offer nicely vibrant and concise colors that accurately replicated the comic book appearance. Black levels also seemed to be fairly deep and dark, and shadow detail usually looked quite clear and appropriately opaque. Ultimately, Superman III offered a satisfying visual experience. The Dolby Surround 2.0 soundtrack of Superman III provided an erratic affair, but it improved as it progressed. Virtually all of my concerns related to audio quality, which started out quite poorly. During the movie’s early sequences, dialogue sounded very thin and brittle, and I often had trouble comprehending what the actors said. Dialogue taken from the set was thin and distant, and re-recorded material didn’t fare that well either. Many lines were looped, and this was not done well, as some speech did not integrate cleanly with the action. However, this problem declined as the movie continued. Speech never became terribly natural, but the dialogue heard during the majority of the film seemed much improved over what I heard in its early stages. Effects appeared to be more consistent, though they also displayed some concerns. These elements sounded a bit wan and lackluster for the most part, and their dynamics were not special. Highs lacked crispness, and bass response sounded deep but ill-defined. For this area, low end was quite loud at times, but it failed to deliver a tight and taut experience. Dynamic range sounded stronger for the film’s music. Its score could become slightly muddy at times, but as a whole it appeared surprisingly robust and bold. Bass response was still a little boomy, but those elements seemed tighter and richer for the score. As for the soundfield, SIII offered a moderately engaging experience. The forward channels demonstrated reasonably good spread, and audio blended together fairly well. I heard some good examples of panning between speakers, and the overall impression was that the front spectrum seemed to be relatively engaging and active. Surround usage largely restricted itself to general reinforcement of the front channels. Some scenes worked better than others. For example, the one in which Superman saved Ricky became nicely engaging and broad. However, as a whole the surrounds seemed to be moderately subdued. Ultimately the audio for Superman III worked acceptably well for its age, but some glaring concerns limited my grade to a “C+”. How did the picture and audio of this 2006 Special Edition compare to the original DVD from 2001? Audio seemed virtually identical, but the transfer offered some improvements. It lost the minor print flaws and edge enhancement from its predecessor. The old disc actually looked pretty good, but this one was just a little better. The 2006 SE also presents some supplements not found on the bare-bones 2001 DVD. We start with an audio commentary from executive producer Ilya Salkind and producer Pierre Spengler. Both sit separately for this edited piece. They start with a discussion of the story’s genesis, changes made from an original plan, and Richard Pryor’s casting. From there they dig into other character and casting choices, visual effects, sets, the movie’s tone, publicity, and its reception. I think this commentary starts well, as we learn about the initial story ideas and why these changed. However, after a while, the track turns very defensive. Spengler and – especially – Salkind use their time to tell us how successful the film was and how much critics liked it. Clearly they’ve heard many negative comments about the flick over the years and they want to convince us that SIII is actually a fine film without many problems. This doesn’t work, largely because a) SIII is a crummy film, and b) it has many, many problems. Instead, the commentary just becomes weird as we hear so many attempts to rewrite history. There’s still a lot of good info to be found here, though, and I must admit even the odd parts are fascinating in a car wreck kind of way. 11 Deleted Scenes fill a total of 19 minutes, 39 seconds. We discover “Save My Baby!” (0:47), “To the Rescue” (1:28), “Making Up” (0:29), “Going to See the Boss” (1:15), “Hatching the Plan” (1:39), “The Con” (3:24), “Rooftop Ski Resort” (7:43), “Boss Wants This to Go” (0:30), “Superman Honored” (0:26), “Gus’ Speech” (0:29) and “Hanging Up on Brad” (1:29). Most of the clips offer fairly minor extensions to existing scenes. That’s the case for “Rescue”, “Boss”, “Plan”, “Con”, “Resort”, “Honored”, “Speech”, and “Brad”. “Boss” actually adds a little definition to the story, as it expands the characters in a decent way. The other extensions lack much reason to appear in the film, and “Resort” gets really tedious as it layers on more and more shtick from Pryor. None of these – or the scenes that don’t just add onto existing pieces – are interesting or worth our time. In addition to the film’s trailer, we get a vintage documentary entitled The Making of Superman III. This 49-minute and four-second piece mixes movie clips, shots from the set, and interviews. We hear from director Richard Lester, writers David and Leslie Newman, director of special effects and miniatures Colin Chilvers, supervisor of optical and visual effects Roy Field, and actors Christopher Reeve, Robert Vaughn, Marc McClure, Annette O’Toole, Paul Kaethler, Aaron Smolenski, and Annie Ross. “Making” takes us to various sets and shows different aspects of the production. We get info about flying effects and other visuals, characters and performances, set details and locations, storyboards and stunts, and a few other production elements. You won’t find a lot of great moviemaking insights on display here, as the interviews tend to be short and without much content. However, all the footage from various sets compensates. These offer nice behind the scenes glimpses and provide a lot of fun. They make this show worthwhile. Superman III is a dud. The movie has a few decent moments, but these are heavily outweighed by lame comedy and unexciting action. The DVD offers a surprisingly strong picture but the sound was less compelling. A mix of pretty good extras fills out the set. I certainly can’t recommend a movie as bad as SIII to anyone other than Superman die-hards. Should those who already own the original DVD get this one? Probably. It offers a minor picture quality upgrade along with a few supplements they’ll enjoy. Anyone without a serious interest in Supes should skip it, though.